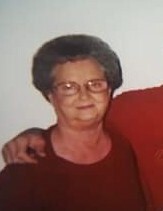 Mrs. Barbara A. Harsey of Castleberry passed away Saturday, January 19, 2019, at D.W. McMillian Hospital. She was 78. A funeral service will be held at 2 p.m. Monday, January 21, 2019, at the Union Grove Freewill Baptist Church with Rev. Mark Gray and Bro Clifton Bucannan officiating, Interment will follow in the Union Freewill Baptist Church Cemetery. The family will receive friends one hour prior to services at the church. Survivors include Husband, Samuel Harsey, son, Adam (Lea) Gray, daughter, Victoria (David) Simmons, sisters, Mary Lou (Wayne) Themms, Ruby Bender, 9 grandchildren, and 8 great-grandchildren. Pallbearers include Dylan Gray, Huston Simmons, David Simmons, Josh Gray, Merle Brown, and Frankie Brown. Mrs. Harsey is preceded in death by her late husband Robert Joseph Gray, and son Michael Gray.